Like silver and gold jewelry, bead accessories never become obsolete as fashion items, and making them can be fun, low-capital, and profitable sideline or full-time business for the creative and industrious. 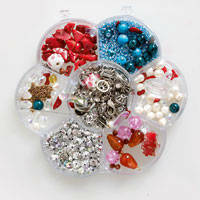 You can start your own bead jewelry business for as low as P1,500. This is all you will need to purchase your main tools – a pair of 2-in-1 pliers (P40) and a long-nose one (P40) – and several packs of beads and stones. To make a pair of earrings, in particular, you will only spend about P150 but you can it up to P750, giving you a clean profit margin of P500 to P600. On the other hand, it will cost you about P270 to make a bead necklace, but you can earn as much as P750 to P900 from it. “What is good about this business is that you can put a 200 percent mark up. The is because the higher the price of the jewelry, the more the people would tend to value it,” says Em Mariano, a jewelry designer, trainer, and owner of FunDynamics, an arts-and-craft training company. There are different bead-making techniques, such as looping, stringing, brooch-making, and knotting. For this project, the stringing technique will be used. It requires wire or string to hold the beads together. All of the raw materials for making dangling earrings and necklaces can be bought at Divisoria, Manila, and at the Wellmanson Sewing Notion store in Quiapo, Manila. 16 pcs spacers from O-ring chain, P50 for 20 pcs. Spacers are any of the minute accessories used in-between beads to provide aesthetic spaces between them. 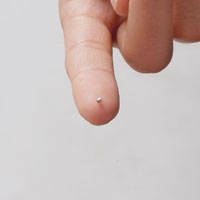 They come in different forms, with metallic and ring spacers as the most common ones. Step 1. Using a pair of 2-in-1 pliers, cut two 10-cm length of gauge no. 5 cable wire. Set aside one of the cut wires. 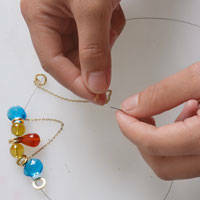 With the other, create a loop and put the teardrop bead stone in the middle of the loop. Always remember that in bead making, the most stunning stone should always be placed in the middle of the loop. After placing the teardrop bead stone in the center of the looped wire, insert spacers on both sides of the teardrop bead stone. Insert yellow citrines and a spacer next to the teardrop stone and spacers already in place. Step 2. 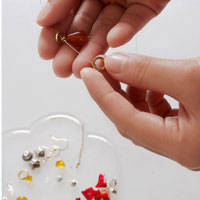 To create dangles for the earrings, cut two sets of 2 inch-long and 3 inch-long chains. Set aside one set. Insert one end of a 2-inch chain onto one end of the looped wire, then insert the other end of the chain to the other wire end. Add the blue glass beads and another spacer to both sides of the beads, then string the 3 inch-long chain like the first one. Step 3. String in the pearl, two corals, a spacer, and two Class A rainbow crystals onto both sides of the wire. Then, insert a teardrop bead or rainbow crystal onto both sides. How do you stay innovative?